Lahnius is the man of the hour. With 1,000 shares of New Order stock to his name, Lahnius joined the billionaire's club. 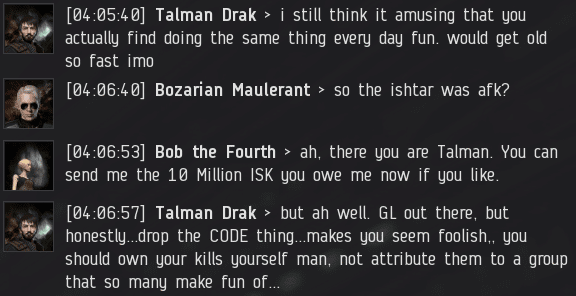 We have now advanced beyond the 1,586 billion isk mark. The inevitable consequence is a Supreme Protector's Tip of the Hat™ to the new shareholder. The Agents of the New Order score numerous notable kills each week, though only a precious few can be highlighted in a Kills of the Week post. Since we've got a little extra time today, let's take a look at this Ishtar gank that didn't make the cut. Agent Bob the Fourth was the Agent on duty that day. It was his job to help Talman Drak discover what EVE is all about. If you've ever wanted to increase your popularity, try ganking bot-aspirant carebears. Even if it doesn't work, you've still killed bot-aspirant carebears. Talman eventually returned to his keyboard to offer Bob the most halfhearted congratulations he could muster--coupled with a suggestion that Bob should cut ties with the New Order. The carebear insisted that he wasn't bothered by the gank. But for some reason, it really seemed to rankle him that the ganker was a Code enforcer. He would've lost his ship regardless, so what was the problem? "I don't mind that they gank people, but they really need to cut out all of that 'Code' stuff." Bob was amazed by how chatty the formerly silent Talman had become. All it took was one reference to a mining permit and Talman was buzzing with energy--all of it focused on getting Bob to stop enforcing the Code. Deprived of his (doubtless "already replaced") Ishtar, Talman prepared to log off for the evening. But he couldn't leave without urging Bob one more time to distance himself from the New Order. How does one know which path to take in EVE? A good rule of thumb: Do the opposite of whatever the bot-aspirants want. Haha this story reminds me of all the idiots on facebook and reddit that say - " ive never been ganked by code but rant rant rant" or the "im in wormhole space and never see code but code are griefing blah blah"
"...it is amusing that you actually find doing the same thing every day fun. would get old fast imo"
ikr? Dumbass carebear can't imagine his own hypocrisy. Just another reason why all highsec carebears should be ganked until they leave. 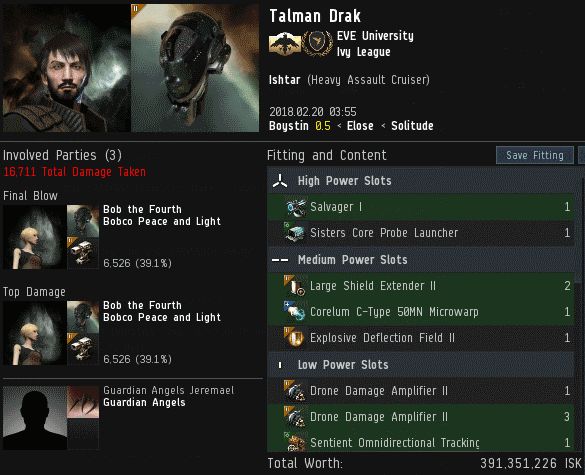 Highsec or EVE, either way everyone wins. There's a sad desperation about Talman's insistence upon Bob's deserting the New Order and its Code. Instead of doing the heroic thing and - I dunno - fighting back, Talman opts for the child's beloved weapon; spite. Useless against an Agent of the New Order (and against almost any adult possessed of the ability to reason). I so enjoyed watching Mr Drak squirm and seethe! 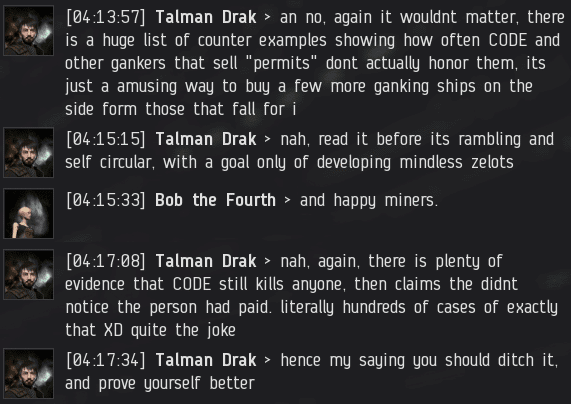 Show me a permit-holder ganked and I'll show you a Code violation.